Click the button below to perform a fresh installation or to update your existing Internet Download Manager for IDM addon. This version will be always up-to-date and should work with the current Firefox beta version and previous versions. Thank you for installing/updating the addon. If you find this site useful, please leave a comment below. Compatible with Firefox versions 53-56 and 57+ Web Extension support! Supports Firefox web extensions, with Firefox 57+ (Quantum) compatibility. It only requires a few click to install or update the addon. Just follow the steps below. Click the "Install" button above relevant to your current Firefox version. Firefox will prompt you to install the Firefox addon. If you have any doubts, we welcome you to check the addon with any anti-virus software. 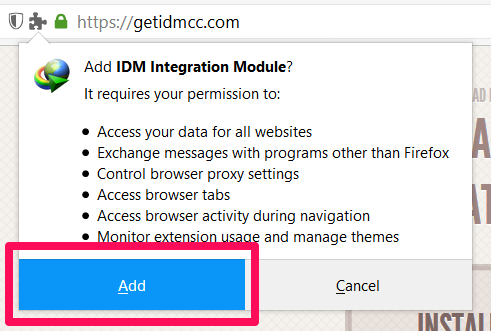 Go to Firefox > Addons to make sure that the IDMcc Addon is installed and enabled! If you find this little effort useful, leave a comment. Words help!